We found a perfect location to shoot some outfit pictures and I love how Autumnal the background looks. Although, lets face it, its pretty much Winter now. It's getting dark at 4pm, It's dark when I wake up, the central heating is on at home and Christmas is fast approaching! This also means that I get to wear big cosy coats and I'm so happy that oversized coats are still a massive trend. I probably should've layered a bit more underneath but I wanted to show this coat with a simple jeans and tee look with my pink and gold mules to add something to it. 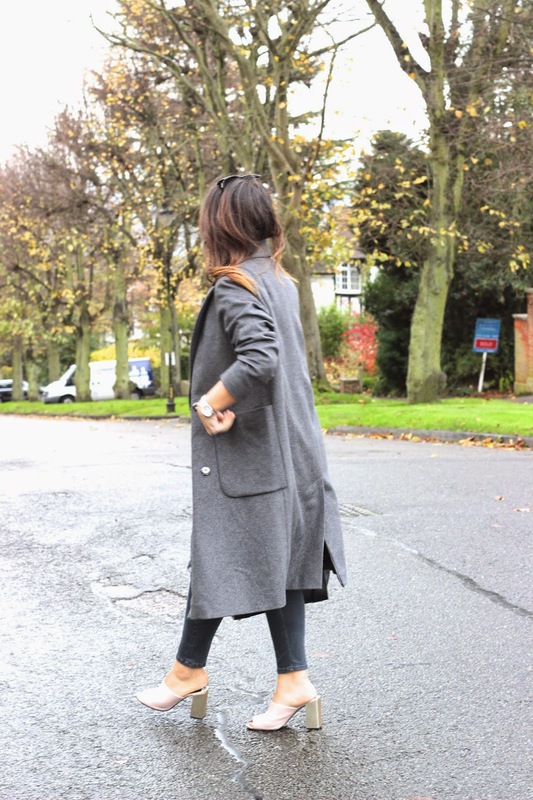 I've never owned a grey coat before but now I realise how versatile it is and so easy to wear. I would wear this same outfit with my white sneakers, or for a more sophisticated look some knee high leather boots. I definitely think its time for me to bring out the big chunky scarves and beanies soon. I'm also loving the whole hair tuck recently as I always have my hair the same it's fun to pretend I have shorter hair sometimes. I really was considering cutting it to this kind of length but I don't think I'll ever have the balls to do it!